I hope you all had a great weekend. I am back today with another Christmas card for you. And for my sins, I decided to make another shaker, and this time a circular one. Every so often I get a bit bored of creating standard sized rectangular cards and so I throw a different shaped card into the mix. 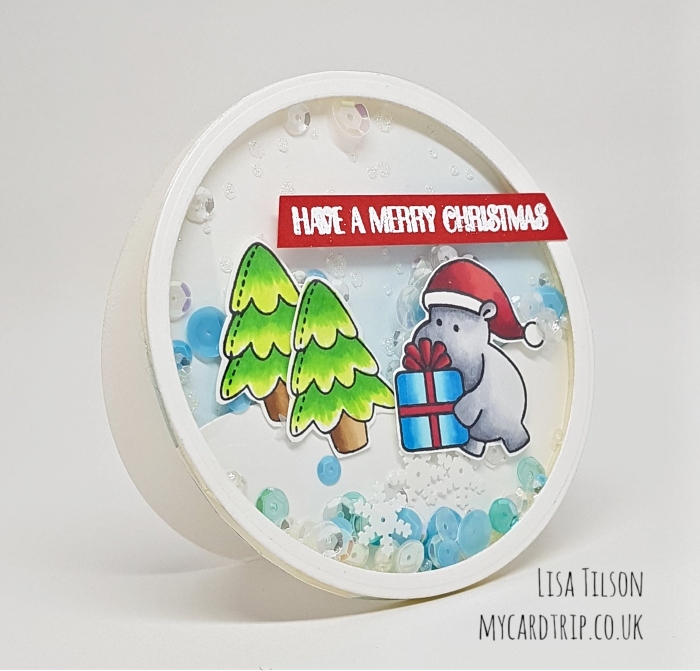 A round card is not that unusual but I thought I’d add the shaker element to make it a little bit different, and of course why not give myself a card to make that takes me twice as long as normal! So here is the little card, it might not look much but whoever gets it needs to know it took ages! I’ll explain more later. And now that I look at it, I think the sentiment is ever so lightly tilted – well that just adds to the charm doesn’t it?! And what you probably cannot see well in the photos, but you can in real life, is the lovely glittery snowfall that I stencilled into the background. So, onto the creation of this little delight! I took my MFT Stitched Circle Stax 2 dies and took the largest of the dies. I die cut some acetate and also two circles from white cardstock – one will form the scene element and one will be the back panel. I then took the two largest dies and took another piece of white cardstock, ran them through the die cut and created the frame element. Onto one of the white circle panels I blended Tumbled Glass Oxide ink, fading it out towards the top. I then took the new Snow Day stencil from Clearly Besotted and some Nuvo Glimmer Paste and applied that through onto the same ink blended panel. It was set aside to dry. My images were stamped onto Neenah 80lb cardstock, coloured with Copics (numbers listed below) and then fussy cut. The hippo is from the Hippo Christmas set, released last month and the trees are from the Winter Plushies set, also released last month. These were also set aside whilst I finished the rest of the card. I created a snow bank by using an MFT Stitched Snow Drifts die and then adhered that to the ink blended and stencilled panel using DST. The images were then popped up into position with foam tape. It all sounds like it didn’t take too long doesn’t it? More on that at the end…. Finally, I stamped the sentiment with Versmark ink, applied white embossing powder and heat set it. This sentiment is from one of the new sets from Clearly Besotted called Smaller Sentiments, and it covers a huge range of useful round the year every occasion greetings (this set will be released on November 1st). I adhered the sentiment with DST and trimmed around the edge to fit the circular shape. 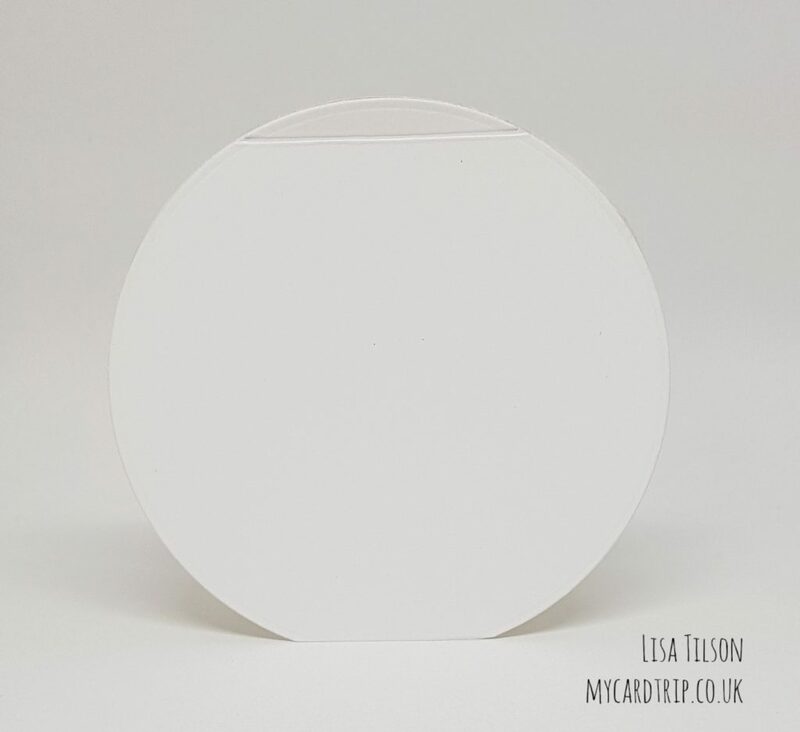 To finish the card, I just needed to make the back panel – so I took the remaining white circular die cut, scored a little section at the top and trimmed a small section of the bottom (so that it stands up properly). I added DST to the scored section and this was pressed down onto the shaker section. All in all it probably took about an hour to make this card. But what really happened was I spent about 3 hours prior to this trying to make a completely different rectangular card – with pink snowy background and lots of trees and frolicking hippos. 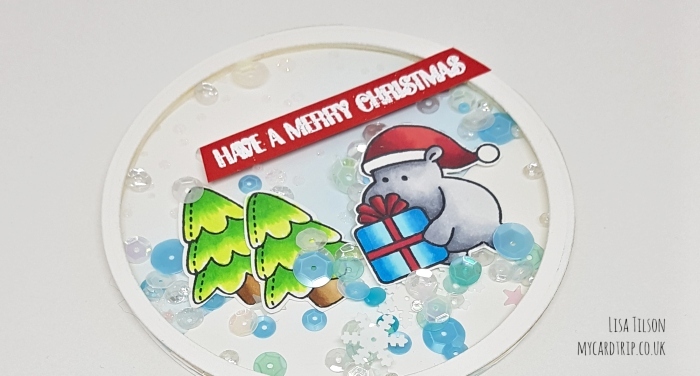 I had coloured 6 hippos in varying different colours and many trees in different greens/teals, and just couldn’t balance the card. So I gave up and made this instead! Thanks for your patience in getting to the end of this rather long blog post. As always I wish you a happy week ahead and I hope you find some time to craft. Thank you for visiting me. I think this is very cute. I do love a shaker card.